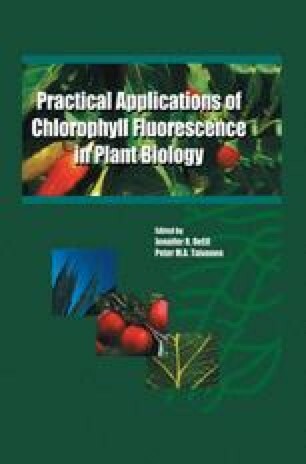 Chlorophyll fluorescence research began in the early 1930s with Kautsky (Kautsky and Hirsch, 1931) who was trained as a physical chemist and stumbled upon the phenomenon by accident. The main paradigm in those days was that the chlorophyll molecules alone bound CO2, absorbed photon energy and transferred that energy to the carbon atom, releasing oxygen to produce carbohydrates. When Kautsky presented his work in 1931 and stated that there was hardly any change in chlorophyll fluorescence yield when going from a CO2-containing atmosphere to a CO2-free atmosphere, it was believed that his equipment had failed. It was thought impossible, if he really was measuring chlorophyll fluorescence, that it would be unperturbed by the presence or absence of CO2. Although he was not a plant physiologist, Kautsky suggested that the light-dependent reactions and carbon fixation could be spatially separated processes in photosynthesis. It was not until the 1950s with the work of Rabinowitch (1951), Rabinowitch (1956) and Duysens (Duysens et al., 1961; Duysens and Sweers, 1963) that the idea of separate light and dark reactions was accepted.